Named in recognition of the $200,000+ donation given by the Club, the dental clinic serves exclusively the estimated 74,000 adults in Wake County who lack access to quality dental care. So focused, the clinic has major medical and health care benefits for those directly served along with the community at large. Wake Smiles operates the clinic as a project of the Wake and Raleigh Dental Societies drawing upon voluntary services from local dentists, hygienists, specialists, dental students, and faculties. The clinic occupies well designed and equipped space inside Salvation Army’s Center of Hope, marking the first time that a Salvation Army center anywhere has housed a medical facility. The clinic welcomes voluntary services of Club members and area Rotarians. The campaign for the clinic was led by Beth Briggs, former Club president. The gift is the largest by far in the Club’s 100 years, exceeding the original goal by raising $205,800. 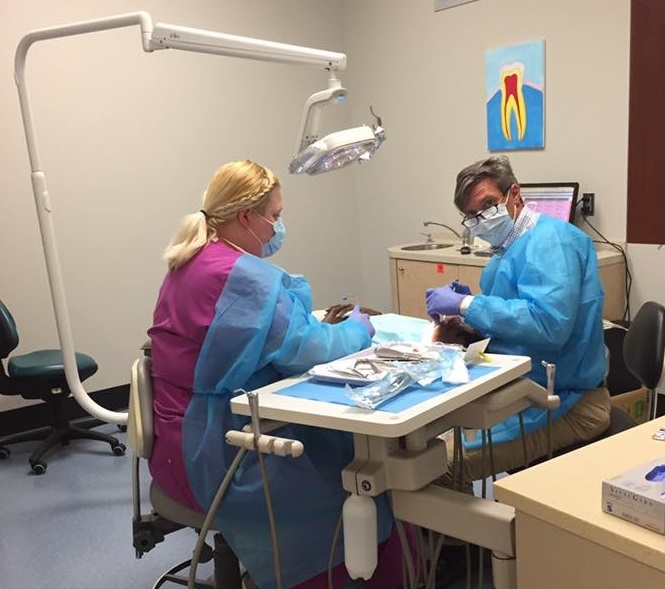 Twenty-four dentist volunteers provided care at 152 patient visits in the clinic saving the ,patients $27,067. The 7 dentist volunteers: Hoda Bassiri, Sassan Bassiri, Jeremiah Davis, Robert Eisberg, Matt Holman, Nahal Miller, Saba Mokry, Yousef Razavi, and Michael Riccobene as well as 14 other dentists donated 88 hours in April 2017 alone!